Forgive the crappy picture! Bad lighting, still no photo-box (Matt promises it's coming soon), bad camera. Sticking with 'some sort of made-at-home, take-out style food' for Fridays (SciFi goes well with that sort of thing, you know), instead of pizza, I had a sudden urge for stromboli. I first discovered stromboli during a seventh-grade Home Economics class, and I've loved it ever since. 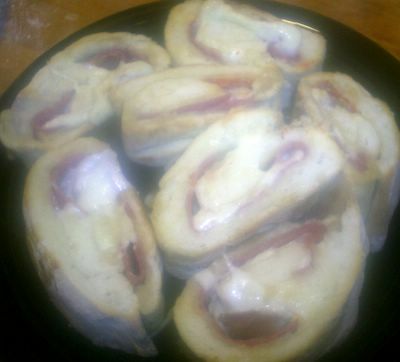 I haven't had stromboli in years, so I searched till I found a recipe I liked. Easy as can be: a fairly basic dough, topped with whatever meats and cheeses you want, rolled up, scored, brushed with an egg wash and baked. Not world-class cuisine, by any stretch, but still fairly good. Matt had salami, pepperoni and prosciutto, with mozzarella and Provolone; mine was veggie ham, veggie bacon and veggie pepperoni, with the same cheeses. Perfect for snacking on, while watching Stargate! Mmmm... I love stromboli. We make it quite often. If I'm feeling particularly in the mood for junk food, we fill it with banana peppers and pepperoni. And you're right- it does go great with a Sci Fi Friday, which we also celebrate! I'm a bit thrown, not having Battlestar Galactica as part of the line-up though...how 'bout you? Naah, I never was a very big Battlestar Galactica fan. My husband misses it, though. I miss Star Trek:Voyager, though. Wish someone would pick that one up and play it as re-runs. I still have my cookbook from my junior high home ec class. I actually use 2 of the recipes often. Oh, Angela...the gauntlet has been thrown, for sure! Peabody; We ended up having a substitute teacher for most of my home ec years...not sure how that happened. But she gave me the best coffee cake recipe, ever. Too bad I can't find it any more! I've only had stromboli once and it was marvelous! We didn't get into Enterprise, either, although we tried and tried. Felt bad when it was cancelled because...c'mon, it's Star Trek! But not too bad. Heh...Matt and I really, really, love DS9! Unfortunately, it...like practically all the Star Trek series...run close to, or over, one hundred dollars a season for DVD! Tanna, for as delicious and easy to make as it is, I don't know why I don't see it more often! Final Days of Blogging by Mail!